The Johnnie Walker Black Label Mood Therapy Light is uniquely & quality handcrafted in the USA by The Bottle Upcycler. Plug-In 100 Blue LED’s (10mm) multi mix, mood changing mini LED’s with 8 function light show controller. Totally mesmerizing! We’ve cut off the ugly glass screw top threads for that unique old school bottle look and topped it off with a quality 40mm (1.5″) Asfour 30% leaded crystal prism ball. Makes the perfect unique gift for the hard to please. Everyone will love it, even grandma. They’re just that cool. Great addition to any man cave, bar, dorm, office, etc. Will look great in any room. This quality product will immediately become a conversation piece. Accept no substitutes. Own “The Original Mood Therapy Liquor Bottle Light”. This beautiful and unique LED liquor bottle light is designed and hand-crafted by The Bottle Upcycler in the USA and made by upcycling a used 1.0 liter liquor bottle into a new piece of functional and unique bottle light art. This is a quality products that do not look like some DIY project thrown together in someone’s garage. All our products are handcrafted in our shop in Southern California by people that care about what they are doing. This Mood Therapy Liquor Bottle Light is made with a beautiful, (used) recycled Johnnie Walker Black Label® liquor bottle. The bottle contains a strand of 100 silver/clear wired, electric powered (110v US), 10mm LED lights with an 8 function control box to control light patterns, including: combination, waves, sequential, glow slow, chasing flash, slow fade, twinkle, and steady on. The cord length from the back of the bottle to the plug is about 2 feet. The lamp must be unplugged to turn it off. These LED’s draw very little current and are cool to the touch. Upcycling is “the process of converting waste materials or useless products into new materials or products of better quality or for better environmental value.” With that said, keep in mind that each item we produce is unique in it’s own way. Upcycled bottles each have their own characteristics and imperfections, no two are exactly alike. The Mood Therapy Bottle Light is not intended as a toy or for outdoor use. Keep out of reach of children. Johnnie Walker Black Label is a trademark owned by The Johnnie Walker Black Label Spirits Company. 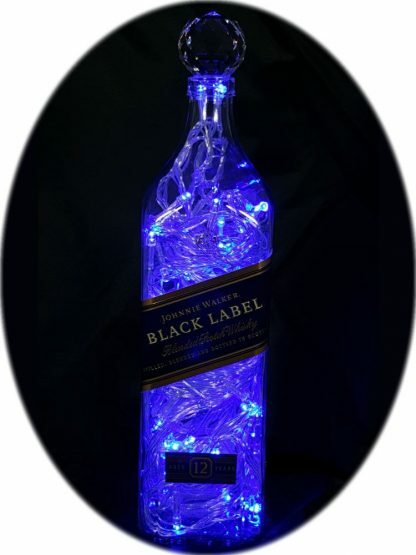 This bottle lamp is not made or endorsed by or affiliated with the original bottle or label maker (The Johnnie Walker Black Label Spirits Company) in any way.